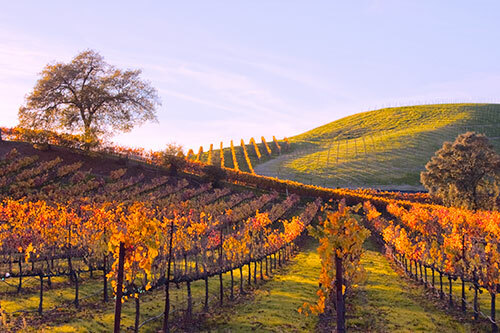 Fall in the Wine Country is a very special time. The hustle and bustle of "The Crush" is at full steam as the grape leaves display their awesome color. This is one of my favorite images as it captures the essence of Fall Color. My favorite lighting in which to capture tis amazing color is in the late afternoon. The Western Sun adds a glow to the already brilliant leaves. Backlit by the Sun, these leaves appear translucent and fragile. This image is taken along Frei Road in Western Santa Rosa during the afternoon magic hour. The vines and hills are aglow in the afternoon sun.